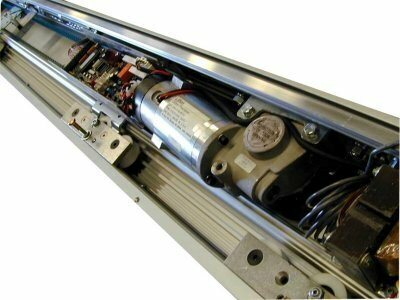 An automatic door actuator is an electrically operated device that is fitted to existing or new door installations – they contain a powered motor that controls the motion of the door. These devices enable the safe and reliable opening and closing of many different kinds of doors, including swing, sliding and revolving doors. As an automatic door actuator is electrically powered they provide a truly silent operation, meaning that they are very useful in situations where an unobtrusive door is paramount. Furthermore, they are fitted with back-up batteries in the event of a power failure. How does Automatic Access use automatic door actuators? We’re experts in providing and installing the correct automatic door actuator for all kinds of doors and entrances. There are numerous premises and situations where these actuators can be used – for instance, where extra help is needed by the door users, such as homes for the elderly and disabled, hospitals and rehabilitation centres, and airports and schools. Automatic door actuators are also extremely useful to companies who are looking to be as energy-efficient as possible as they help to eliminate unnecessary drafts through exterior doors and corridor end doors, as well as in workshops, studios and so on. Actuators can also be used for health and safety purposes; by ensuring that doors are kept closed at all times actuators can prevent the spread of fire and smoke through burning buildings. Automatic Access recognises the importance of automatic door actuators – whether they are being used for safety, comfort, or both, we realise the needs of our clients and respond accordingly. Whether you are a hospital that needs automatic doors for hygiene reasons, or a department store that wants to create the most comfortable and seamless experience possible for their shoppers, we have the perfect automatic door actuators to meet your needs.